When people talk about ‘productivity apps’, they usually mean apps that help them get things done better or more quickly. Lots of these have been created especially for musicians, but I decided to write this post about metronomes after remembering a discussion I’d had with a student. I’d asked her to download a metronome app onto her phone for practice sessions, but since the one she had been using for the past few weeks was different from the app I’d shown her, she had no idea how to use it. She was only about Grade 3 standard so most of the functionality it had didn’t make much sense to her and ended up making her practice more difficult. This made me realise that because I’d been using the same one for a while, I hadn’t thought much about how different they might be. 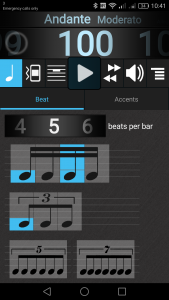 There are lots of musical apps around that include metronomes alongside other features but this post will concentrate on apps that have been developed for this specific purpose. Hands up if you knew that Google had developed one of these? I didn’t, but it makes sense. This one is extremely basic but does the job if you just need to check a tempo. All you need to do is a quick Google search for ‘metronome’ and it’s there. It works well in mobile web browsers too. When you first open this app, a pop-up makes sure you know that only people who can read standard classical notation will be able to use most of the features. Once you get into it, it’s very clear why. After a few minutes of trying to work it out, I had loads of fun messing around with the different rhythms and accents in this app. One of my favourite functions on this is being able to play multiple rhythms simultaneously, which is great for theory-based lessons or those times when your brain can’t quite work out how something is meant to fit. One annoying thing was that in the version I used, closing the screen or moving to another app reset everything. This got a bit annoying but I suppose it does mean practice should be more focused, or something. Visually, this is the best-looking metronome app that I’ve seen. Like most apps with different tiers, the free version is pretty basic and is definitely for people who like the more standard digital metronome look. The paid Pro version of this offers a lot more and will be worth it if you think you’ll use them at all. 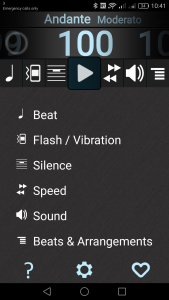 Demo playlists are included in the free version, but Pro also gives you the chance to create and share your own with other people using this app. Compared to some other metronome apps, the Pro Metronome’s Pro features are aimed much more towards drummers but this shouldn’t stop other musicians from trying it out. Aside from these three, you’ll already know that there are tons of basic free metronome apps available on all the main mobile phone platforms. Some of these are better than others but if you’re going to use one for teaching, it’s worth thinking about what would be best for that student’s level of learning. This is even more important if you’re asking them to practice with one at home. A complete beginner could be completely overwhelmed by all the flashing lights, rhythms and beat options but a more advanced student could find that a different metronome app might have some useful functions that gets them where they need to be a lot quicker. Even if you have one that works for you, keep looking around and find something that suits each of your students. I’d be interested in hearing opinions from other people on these. 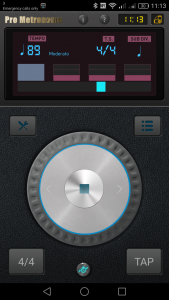 Are there any other metronome apps that you think more people should be using? How do you use metronomes in teaching? I’ll be reviewing my tuner apps next but are there any other apps that you wouldn’t be able to live without? Let me know in the comments section.